Flavorella apriums and Red Beaut plums from Twin Girl Farm. Today is sunny and gorgeous. The perfect weather to put on a sundress and sandals and buy $15 worth of fruit over at the Noe Valley Farmers Market. I hadn’t been to the Noe market in a couple of weeks, and I was happy to see that Twin Girls Farm had so much stone fruit. White peaches and nectarines, yellow peaches (which tasted a little watery to me), aprcots, apriums, two kinds of plums (Red Beaut and Flavorosa), lovely cherries, and, of course, pomelos and navel oranges. I am still determined to make cherry pie, so I picked up about 1 1/4 lb. of cherries to make sure I have enough nicely ripe ones for the filling. Nacho pointed out some ones that were cooler, so I grabbed those. I picked up some Red Beaut plums, which, I just learned, are a Japanese variety that are often some of the first plums of the season, as well as some Flavorella apriums. This NPR interview with a Southern California fruit grower, Fitzgerald Kelly, talks about Flavorella apriums and Flavorosa pluots. 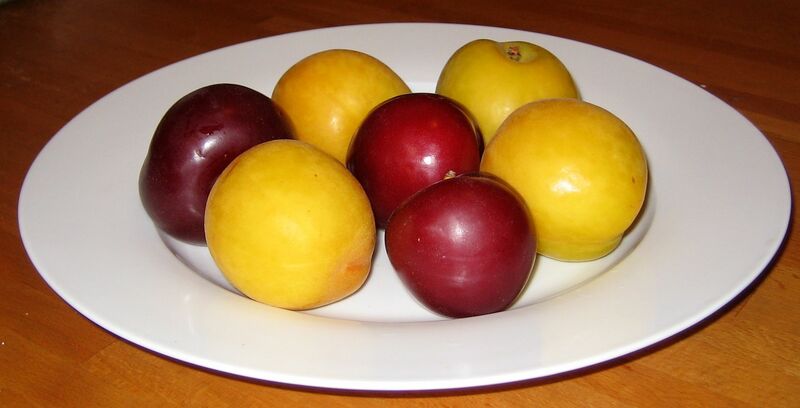 The woman and K&J last week told me that apriums are apricots crossed with plums crossed back with apricots (75% apricot, 25% plum) and pluots are plums crossed with apricots crossed back with plums (75% plum, 25% apricot). I always knew the basic makeup of apriums and pluots, but I never thought about what order the fruit was cross-bred. Hidden Star Orchards didn’t have a single apple out when I walked by, but their bins were full of huge round blueberries and Bing cherries. I wished I had sampled more cherries before buying mine at Twin Girls, but I was still happy with my purchase. At Happy Boy, I picked up a few handfuls of broccolini, which was on sale for $4/lb. I had been hoping to find some artichokes there, but I didn’t see them at any of the stands. Maybe the season ended a bit early. I walked through the rest of the market, then doubled back to Capay to pick up some tomatoes for $3/lb. Next time, I am going to take my camera and get more information from the vendors. Writing these reports up has helped me think even more about the produce I buy. Also, I have to say, the folks who sell at the Noe farmers market are just about the nicest people ever. Those who care about such things may have noticed that I’m going with no apostrophe in “Farmers Market,” because I think “farmers” is an adjective here, not a noun that possesses the market.